The relatively new .300 WSM offers the best of both worlds — power and efficiency. The .300 Winchester Short Magnum was introduced in 2000. Initially, it was chambered in short, light Browning and Winchester rifles. The .300 WSM duplicates .300 Win. Mag. velocities, while consuming about 10 percent less powder. At one point, it and other WSM cartridges were embroiled in a legal battle over intellectual property infringements. This, in part, stifled some Winchester Super Short Magnum’s popularity. Though, the .300 WSM developed a robust following. Introduced in 2000 and chambered in short, light Browning and Winchester rifles, the .300 Winchester Short Magnum demonstrated a remarkably accurate ability to duplicate .300 Win. Mag. velocities, while consuming about 10 percent less powder. The .300 WSM, an original Winchester design, fits handily into bolt-actions sized for a cartridge length of 2.860 inches. For highly efficient and consistent powder burning, the .300 WSM has a short-fat powder column geometry, a concept revered by accuracy-obsessed benchrest shooters for nearly three decades. This cartridge — and all its Winchester Short Magnum siblings — became embroiled in a legal battle, and the end result was a less than enthusiastic appeal on the part of other manufacturers to offer rifles and/or ammunition for sale. 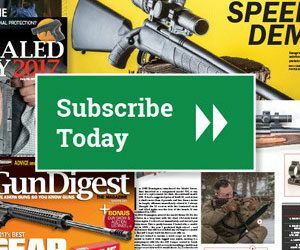 However, unlike the Winchester Super Short Magnums that are collecting dust on the shelves or in shooters’ gun racks, the WSM line still enjoys moderate appeal, especially the .270 and .300 offerings.